Outstanding work and persistence by our 19th district officers paid off with the arrests of two offenders who robbed a man at gunpoint around 7:00 Tuesday night in the area of 1200 West Belmont. Tasers were deployed in the capture of the uncooperative offenders. The first 911 call came from a witness who saw the victim screaming and chasing the offenders westbound on School Street from Racine. Police caught up with the victim at 7:03PM and began their hunt for the two offenders, described as two black men wearing black shirts. Less than a minute later, a man wearing a yellow shirt, but otherwise matching the victim's description was stopped at 3248 N. Racine. At nearly the same time, other officers in the 1200 block of School Street found two black shirts, a bag, and the victim's wallet lying in a gangway where the robbers had changed clothes. The suspect in the yellow shirt was positively identified and taken into custody. 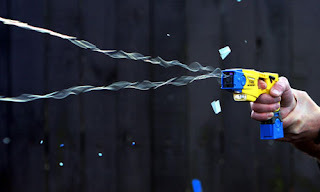 It is not clear at what point a taser was deployed. For nearly 40 minutes, officers carefully searched the area for the second suspect who still had the firearm, giving special attention to the alley that runs between the 1200 blocks of School Street and Melrose Avenue. At 7:43PM came the good news: The gunman was in custody and the weapon had been recovered in the alley officers had been combing. A taser was deployed when the offender failed to cooperate with police. Even after being tazed and handcuffed, the one-time gunman continued to kick and fight with officers. Chicago Police Department case #HW446381 details this incident, classified as a robbery with a handgun. Thank you, officers, for a job well done!